Plexiglass signs provide you with a premium quality presentation method to showcase your company's products, services, and ideas. Mounting your prints on or behind plexiglass produces stunning results for wall murals, site plans, architectural designs, development plots, real estate displays, and photographic mounting. The second way to utilize plexiglass is to face mount the prints to the back surface of the plexiglass, so the adhesive is actually on the face of the print. This method creates an absolutely beautiful display because the plexi adds a lot of depth to the image and makes it really stand out. The thicker the plexiglass, the more depth the image has. It gives the appearance the design is cased in glass, and is truly a premium display. Face mounted plexiglass displays are often found in corporate offices, model homes, airports, architectural displays, kiosks, museums, and backlit light box displays. The prices below reflect reverse printed images on adhesive backed vinyl, face mounted to plexiglass. However, we can also print and face mount prints produced on paper, photo paper, backlit vinyl, and backlit film such as Duratrans. Please contact us for pricing or if you have any questions about these other printing mediums. 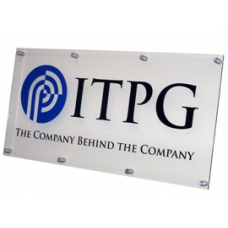 Our Plexiglass signs can be finished with grommets, hemmed edges, reinforced webbing, and pole pockets, depending on how and where you need to hang the banners. The prices for each option are shown in the table above. If you are unsure of what type of finishing would work best for you, please visit our banner finishing page for more information or contact one our account executives for help. We will ship your Plexiglass Sign order in 3 business days from the time we receive your order and final print-ready design files, or proof approval if we are creating the design. Faster turn-around is available if needed, but rush fees may apply. Several shipping options from Ground to Priority Overnight are available to ensure you hit your due date. Contact us if you have any questions. If you are ready to order your Plexiglass signs, please fill out our vinyl banner order form or contact one of our account specialists today!